HAVE YOU PLAYED 3,125 WAYS TO WIN? 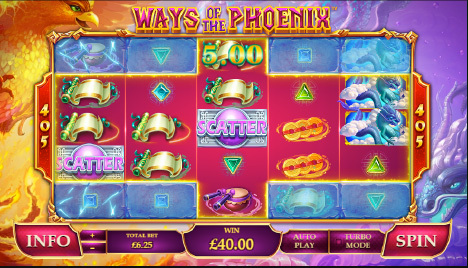 Ways of the Phoenix slot is at FlyCasino! This is an amazing 3,125 ways to win slot that comes with, wild substitutions, a free spins round, and a staggering win potential of up to 62,500 times your bet! It’s really different. You begin play with a 1x3x5x3x1 reel set which offers 45 ways to win. Get a winner and more symbol positions open up which increases the number of ways to win. These reduce again following a winless spin. Land 3, 4 or 5 of the scatter and you’ll trigger thePhoenix & Dragon Free Games feature. Every winning free spin during the feature unlocks more symbol positions. This is HUGE! Those positions may shrink in the base game but that’s not the case here when in the feature! The reels can only expand or remain the same. If you manage to open the whole of the 5×5 grid, you’ll have 3,125 ways to win! More free games! Landing just 2 scatters of them adds another 2 free spins to your total. A full re-trigger of 8, 20 or 50 extra free spins is possible if you land 3, 4 or 5 scatters. What’s better is there’s no limit to how many additional free spins can be won. Double 150% Monday! From 00:00GMT until 23:59 GMT, all members on their deposit of $/£/€50 or more get a $75.00 bonus. Claim 2X.